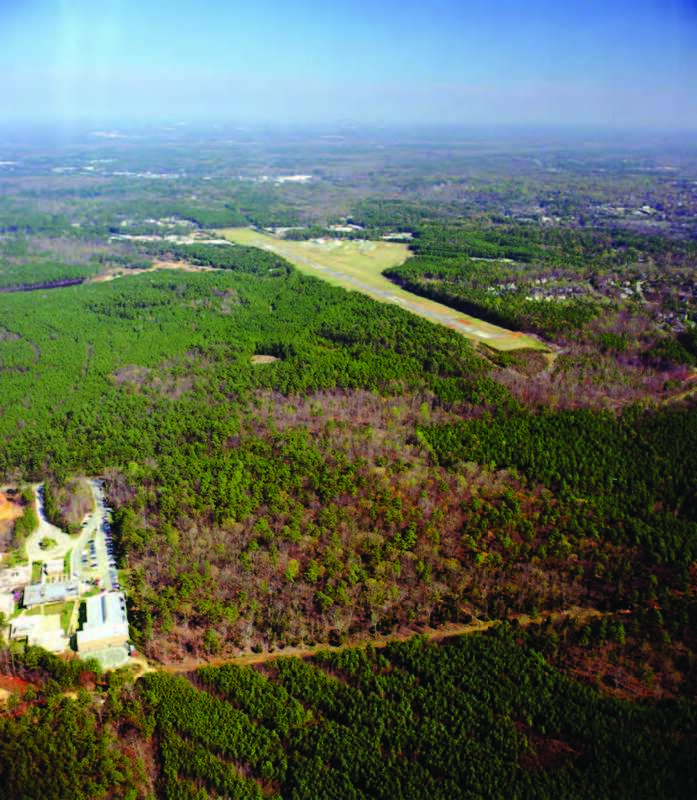 The Carolina North site consists of approximately 1,000 acres of land on the west side of Martin Luther King Jr. Boulevard, about two miles north of the main campus. The site is in Orange County and straddles the boundary between the Towns of Chapel Hill and Carrboro. Two streams, Bolin Creek and Crow Branch Creek, cross the western and northern portions of the site respectively. In 1940, the property was devised, in part, to the University of North Carolina at Chapel Hill by Henry Horace Williams, Professor of Philosophy at the University from 1890 to 1940 and Chairman of the department from 1890 to 1935. Other parcels comprising the remainder of Carolina North were acquired at later times. Subsequent to University acquisition, the property served a variety of support functions for the Town of Chapel Hill and the University. These activities were concentrated on the southeast corner of the site near the Martin Luther King Jr. Boulevard frontage at Municipal Drive. The primary use of part of the Carolina North property today is Horace Williams Airport. The airport dates from the 1920’s. The University plans to relocate its MedAir operations to the Raleigh-Durham International Airport. The University also uses a portion of the site for storage parking and grounds maintenance and support activities such as lay-down areas, construction storage, mulching, and materials supply. A portion of the site was used by the Town of Chapel Hill as a municipal landfill. Although that operation ceased in 1973, the approximately 40-acre landfill is still a significant site feature today. From 1973 to 1979, a one-quarter acre portion of the site was used to dispose of hazardous waste from the University’s research activities. That source material is being removed in 2008, and on-going groundwater remediation will continue near Crow Branch Creek. The remainder of the property retains its natural landscape, forest, streams, and wildlife making it one of the few expansive green spaces in Chapel Hill, North Carolina. The Carolina North Forest, as it is now called, is actively managed by the University. 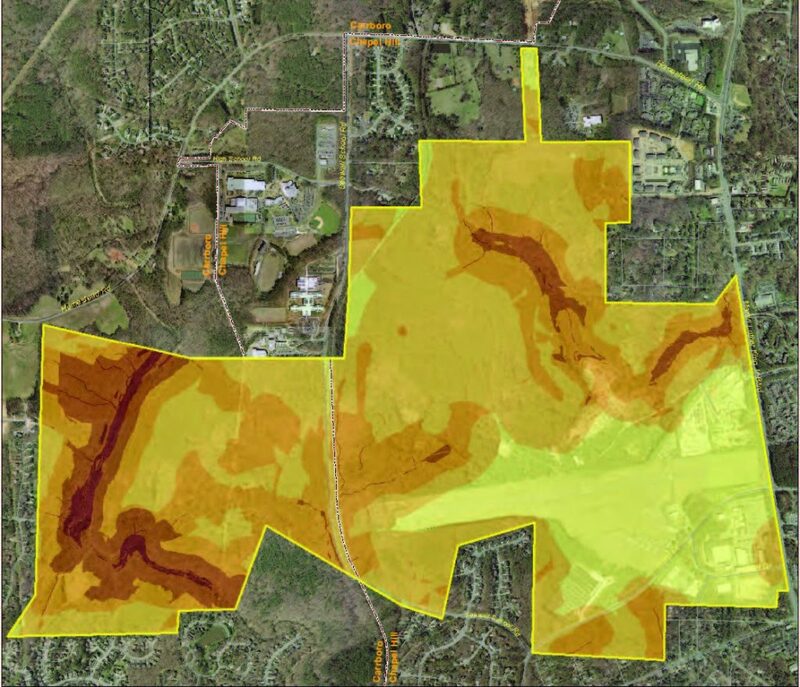 In July 2006, an ecological assessment of the Carolina North property was conducted by a third-party independent consulting firm to determine the suitability of the site to support development without com-promising ecological stability and integrity. This assessment was based on the ecological, cultural, historic, and recreational characteristics of the site. Inventory and analysis included water resources, geologic formations, soils groups, approximate tree stand age, land use/land cover, morphology, landscape ecology, regional landscape ecology, state and local government natural areas designation, and cultural and historic resources. Data was collected on-site, through literature searches, and in interviews and meetings. These components were evaluated by consultants and an academic peer-review group. The multiple layers of analysis were then compiled. The resulting assessment identifies the portions of the site that are relatively more suitable for conservation or development. This ecological assessment was a critical foundation for the planning process. The assessment provided a physical basis against which the discussions on development patterns, transportation, open space, connections, site management, and utilities infrastructure could be evaluated. The site fronts only one road with four or more traffic lanes – Martin Luther King Jr. Boulevard – on its eastern side. Martin Luther King Jr. Boulevard is a five-lane arterial road connecting Carolina North to main campus and downtown Chapel Hill to the south. Martin Luther King Jr. Boulevard also provides a direct connection north to I-40, the primary highway serving the entire Research Triangle region as well as rapidly growing areas to the east and west. I-40 is a critical connection for most of the University community who live outside of the Chapel Hill/Carrboro area. There are no plans to widen or add capacity to Martin Luther King Jr. Boulevard at this time. The southern edge of Carolina North is flanked by Estes Drive Extension, an important east-west connector for the community. While currently a two-lane road, the Town of Chapel Hill plans to upgrade it to a three-lane road with bike lanes. The Town of Carrboro has installed bicycle upgrades on the portion of Estes Drive Extension under its jurisdiction. Seawell School Road divides the western part of the site between the Towns of Chapel Hill and Carrboro. Seawell School Road is a two-lane north–south road connecting Homestead Road and Estes Drive Extension. There are no plans for any significant improvements to this road. At the north, a narrow panhandle of property connects Carolina North to Homestead Road, now a two-lane road with plans for upgrades similar to Estes Drive Extension. While transportation access to the site is a major challenge, there are opportunities to balance limited roadway system capacity with multiple types of transit. Within the 250 acres, the relatively flat topography offers excellent potential for all modes of circulation. The towns of Chapel Hill and Carrboro are served by an excellent, fare-free local bus system. The University is a primary funder of this system which serves both towns including the main campus and the Carolina North site. Regional transit service is limited. This is a major challenge since about 65% of existing University employees live outside of the Chapel Hill/Carrboro area, and the vast majority has no choice but to rely on automobiles to get to campus, including those who use park-and-ride. Currently there are only three regional bus routes, mostly operated by the Triangle Transit Authority (TTA), that serve Chapel Hill from the east, Durham, and Hillsborough. The Research Triangle region’s long-range transportation plans include improved transit services, focused on fixed guideway or rapid transit in several corridors. The official Durham-Chapel Hill-Carrboro Metropolitan Planning Organization (DCHC MPO) long-range transportation plan includes fixed guide-way transit serving main campus and downtown Chapel Hill from Durham (the US 15-501 corridor) and from the east along I-40/NC 54. The towns of Chapel Hill and Carrboro and the University undertook a study to identify transit improvements within the Chapel Hill transit service area that will result in a Long Range Transit Plan. The transit needs of Carolina North are being addressed by the study that examines travel within the towns as well as its connections to the region. A number of corridors are being assessed to identify the appropriate level of transit investment and determine priorities for investment. Corridors that are emerging as candidates for busways or other forms of transit are Martin Luther King Jr. Boulevard from I-40 to main campus and US 15-501 from Durham. Various entities in the Research Triangle region are participating in developing a regional transit vision plan. This effort is examining regional transit needs and priorities including services to the Chapel Hill/Carrboro area. 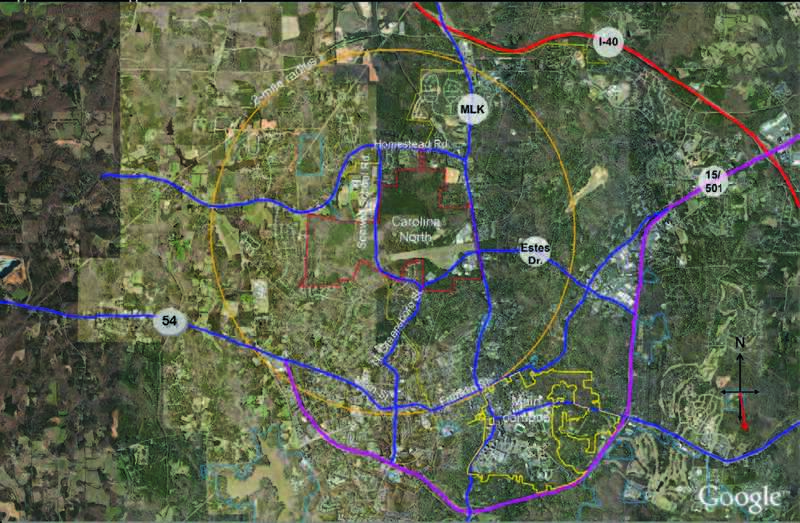 While the local study described above is a separate initiative specific to the Chapel Hill/Carrboro area, many of the same corridors are being analyzed in both studies. The towns of Chapel Hill and Carrboro both encourage non-motorized forms of transportation, and have included a number of greenways and trails improvements in their transportation plans. The development of Carolina North affords the opportunity to link and supplement these resources. Existing utilities infrastructure on the site is limited and was developed ad hoc to serve a wide variety of historic uses. Several utility easements cross the site, including a high pressure natural gas main owned by PSNC Energy. Orange Water and Sewer Authority (OWASA) owns and operates water and sanitary sewer systems in the vicinity of the Carolina North site. Some smaller power and data lines serve various portions of the site.